I read this devotion today, and thought it was worth passing along to you. Hope you are blessed by it too! It is from Experiencing God Day by Day: A Devotional and Journal. I’ve listed the verses below for easy reference for you. Jesus put His teaching into language a fisherman could understand. He told Peter to put out his nets into the deep water. Peter hesitated, “Master, we have toiled all night and caught nothing.” Peter had been fishing all night, had washed and repaired his nets in the morning, and then listened to Jesus teach. He was tired. He probably was not expecting a dramatic encounter with God at a time like that. Yet, as Peter obeyed Jesus, he pulled in such a miraculous catch of fish that his boat almost sank! Peter was filled with amazement and recognized that he had just experienced the power of God (Luke 5:4–11). Peter learned that with a command from Jesus, he could do anything. 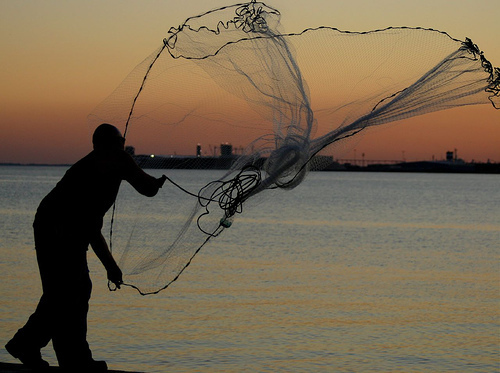 Thus, Jesus was able to reorder Peter’s priorities from catching fish to catching men (Luke 5:10). Peter’s obedience led to a dramatic new insight into the person of Jesus. This was an invitation to walk with Jesus in an even more intimate and powerful way. 6 When they did this, they caught a great number of fish, and their nets began to tear. 7 So they signaled to their partners in the other boat to come and help them; they came and filled both boats so full that they began to sink. 10 and so were James and John, Zebedee’s sons, who were Simon’s partners. “Don’t be afraid,” Jesus told Simon. “From now on you will be catching people!” 11 Then they brought the boats to land, left everything, and followed Him.